Put the peeled tomatoes in a bowl and with a fork and knife cut the tomatoes into tiny pieces. 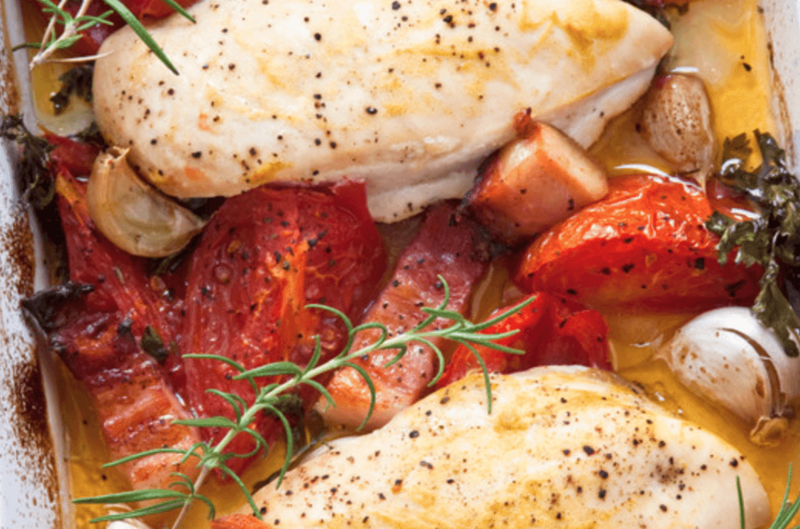 Put the tomatoes on an oven dish and place the chicken on top (that you have seasoned with the coarse sea salt). The idea is that the chicken will half cook in the tomato fluids and will be half grilled on top. Sprinkle the cut onions onto the chicken filets. Chop the cherry tomatoes in half. Sprinkle the rosemary on top and place in the oven for 45 minutes on 180 Celsius.